You may be wondering just who are Leader Stores? But actually, they are one of the better known retailers, they are just not as well known for their garden buildings as they should be. Hey, if Leader Stores are good enough for 60 Minute Makeover, then they are good enough for us. They do not have a ton of shed or a ton of playhouses at Leader Stores, but they do have a decent garden buildings section with a little bit of everything in there. Sheds, arbours, playhouses, log stores and other such things you would expect. 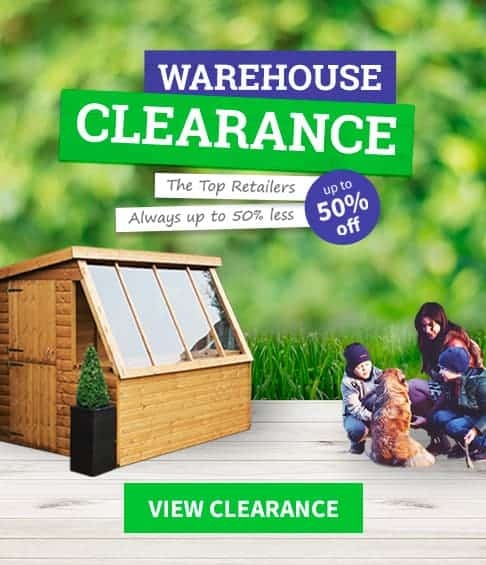 These are a general household retailer so they do have thousands of different items for you to look at and this can make finding a Leader Stores voucher code that is specially for their garden buildings very hard. What we are going to do today is make sure that once you have read this Leader Stores money saving guide that you will know the actual ways you can get a great Leader Stores deal. We are not going to mess you around like money saving sites do, make you click about 42 different links, sign up for something only to then link you to their homepage and not save you a single penny. We want to make sure that you not only get the best deal possible, but also we want to make sure you do not get your time wasted by these pointless money saving sites! We know that if you have come to this page you are looking for a discount code for Leader Stores, as we explain further up Leader Stores dont often issue discount code. As such we thought you might like to see what are some of the best discounts that are currently on offer from other garden building retailers. The best tips that 90% of people who SAVE money at Leader Stores use! We must admit it would be awesome if you could go to a site and there actually was a Leader Stores voucher code that could save you as much as 75% off a shed, but the cold hard facts are no garden building retailer is going to offer the general public a deal like this. They would be out of business in a week! But that does not mean there are no deals to be had or ways to help make getting that dream shed a reality. Right here we have genuine ways that you can make your money go as far as possible when shopping at Leader Stores. They often have garden buildings on sale: Of course as Leader Stores are a retailer who literally sell the kitchen sink, their sale section is going to have a little bit of everything in it. But from time to time, they do have sheds, playhouses, arbours and other garden structures in their sale section. Now you may think that you will have to scroll through pages and pages of different sales items, but they do give each section home, kitchen and garden for example their own individual sales page. We are not saying that there is always a shed on sale here, but this should always be the first place you look when you go to the Leader Stores site. TIP TWO: They Try To Beat The Prices Of Their Competitors! They will match or beat the price of the competition: You do not need a Leader Stores voucher code to take advantage of this offer. We have seen many different garden building retailers who offer a price promise, but Leader Stores are one of the few who claim that they will not just match a price, but they will try and beat it! This is pretty amazing and if you do find a shed you like the look of on another site, then it is well worth seeing if they have it here as well. Who knows, their price promise might result in you saving a couple of extra pounds on it. It may not sound like a lot of money, but as a very annoying TV advertising campaign says, every little helps. Leader Stores have a fair finance option: No one wants to be in debt, but if you do want that dream shed and there is no magical Leader Stores voucher codes in sight, then have a good look at their finance options. Their interest rates are just below the 20 percent mark if you pay up whatever it is you purchased over 18 months. But if you pay everything off in 12 months or under then you do not pay any interest at all. This is a great deal and if you feel that you can afford to pay off a shed, playhouse or whatever in 12 months, then it is worth having a think about as it will get you what you want now without having to save up for it. Have a peek at their Twitter page: It does make us feel kind of cool and modern just like the kids to tell someone to follow something on Twitter! But in all seriousness if there is a flash sale happening at Leader Stores then you can bet it is going to be posted on here pretty much right away. By following them on Twitter, you can save your email from being spammed with newsletters, but you can still keep an eye open to see if there is any sales going on. Of course as they are a general household retailer, you will have to look through many things that do not relate to gardens, but we feel it is worth it. Like them on Facebook: One you have finished your argument with a stranger on Facebook over what is better, Star Wars or Star Trek (the answer is Star Wars by the way), you can then have a look at the Leader Stores Facebook page. We will admit that pretty much anything they put on Twitter ends up on here and vice versa, but we know there are some people who just like Facebook or just like Twitter. Anyway if you do want to keep informed as to when special offers or flash sales are happening, then checking out their Facebook page is a great way to do this. A round-up of all the current Leader Stores voucher codes we found online. We know that the ways we have listed to get a great Leader Stores deal up above may not seem as exciting as stumbling across that mythical Leader Stores discount code or special promo code, but the fact is the methods we listed above actually work and have resulted in people saving money when buying a garden structure from Leader Stores. Now in this next section we are taking an eagle eye look at those money saving sites who claim all kinds of ridiculous things. They will save you a million pounds off a shed if you sign up for their newsletter, sacrifice a goat and they will give you a free summerhouse and all kinds of other bogus money saving methods that will not save you a penny. The fact is once you click their links these sites really couldn’t care less what you do! It is just all about getting you to click their links and that is just totally lame and a huge waste of your time! There are many so called Leader Stores voucher codes being offers on various money saving sites and we are looking at the most popular ones. Now while they may be popular, that does not mean they are good. As a matter of fact, none of these sites are going to save you a penny more than if you were to have just gone to the Leader Stores site directly! We did a Google search to find the most looked at sites when it comes to finding Leader Stores deals. We used the most popular and basic search terms which are: Leader Stores Voucher Codes, Leader Stores Coupon Code, Leader Stores Current Discounts, Leader Stores Discount Codes and Leader Stores Sale. The majority of Leader Stores deals are not for garden buildings! We were actually very impressed with the amount of garden buildings like sheds and playhouse, as well as accessories like arbours and log stores that we found on Leader Stores, but garden items are just a small part of the Leader Stores arsenal. So even though some of the sites we have listed below may have deals that are happening right now on the Leader Stores site, most of them are going to be for things other than garden buildings so keep that in mind before you look through pages and pages of so called deals on one of the sites below. What they claim? My Voucher Codes is pretty stacked when it comes to Leader Stores voucher codes and deals. They have a very impressive selection which can take a while to look through. Right at the top they do mention that the deals which they have are all current for whatever month it happens to be when you are looking at the site. What We Found? We like to be fair here at WhatShed and we can say that all the deals we clicked on were actually valid, but none of them were for sheds or anything like that. While the Leader Stores deals they have on My Voucher Codes may be valid, they were all just the same deals you can get directly through the Leader Stores site. So by coming here you are not actually saving any extra money at all. What they claim? Close to the top of their Leader Stores voucher codes page, Voucher Bin make the claim that the deals they have are current. We are making this guide in June 2016 and that is when they claim their deals are valid for. What We Found? There are very few actual deals listed on here and most of them are just basic links to the Leader Stores homepage. What really grinds our gears is the way they have a bunch of old expired Leader Stores discount codes and deals. They do not call them expired though, they just call them unreliable, which is really weird. Do not click these as they will waste your time even more than their so called current deals! What they claim? My Voucher Codes is a site that is really not making any wild and outrageous claims. As a matter of fact they keep things pretty straight and narrow and just get straight to the point with a section of what they claim are current Leader Stores deals. What We Found? This is a rather odd site as they are not actually making any bold claims with any of the deals that they have listed. But at the same time the deals they do have listed are not really what you would class as deals. They are just general things that Leader Stores offer like free delivery, discount on your first order and so on. Just very generic things that you always get when you shop at Leader Stores so clicking the links here is just a big waste of time. What they claim? Voucher Slug claim that the Leader Stores discount codes and deals which are listed at the top of the page are all current. They also claim that this section is looked after on a daily basis. What We Found? To be fair, the first section of Leader Stores deals that are listed on Voucher Slug are deals and offers that are actually current and happening on the Leader Stores site. While these will not save you any more money than if you had just gone to Leader Stores directly, at least they are current deals. Our problem with Voucher Slug is under here they have expired deals and deals for other brands! DealsDaddy.co.uk – Has deals that do not exist! What they claim? Deals Daddy at least do not claim to have the most current Leader Stores voucher codes or anything like that. Instead they claim that they have popular voucher codes. What We Found? There are Leader Stores discount codes for all kinds of items here, but the ones related to gardens that we clicked simply did not work or exist. Perhaps the site has not been updated in awhile and these deals have just expired, but that does not help your wallet out now does it? This is just a huge waste of your time and will not save you any extra money at all. What they claim? On most of the voucher codes guides we have done, we have come across UK Promo Pro and they are always claiming the same thing no matter the retailer. They claim that the Leader Stores discount codes that they have are actually valid for the current month. What We Found? There are two parts to the UK Promo Pro Leader Stores voucher codes section. First of all they have their current deals which most of them to be fair are the current offers that are running on the Leader Stores site. Some though are just random links to various things. While valid, these deals will not actually save you any extra money though. After this is their expired codes section which is pretty much just as big as their valid codes section! What is worst is that they try to tempt you to try this codes out. They will not work, but UK Promo Pro may still make a few pence off you clicking them, so do not bother. What they claim? While not a claim, one thing that Net Voucher Codes do that is a little different is tell you the date the Leader Stores deals they have were uploaded. So instead of just saying, hey all these codes are good for June, each one has its own independent start date and in some cases expiry date as well. What We Found? Nothing too offensive to be honest with you. The “deals” they have are just a few current offers Leader Stores have going on right now. Deals you find right on the Leader Stores home page. The one thing we did not like was how they also have a list of other retailers just below their Leader Stores section. It would be very easy for a person to keep scrolling down and not realising they are looking at offers for another retailer. What they claim? Promo Vouchers make the claim that other sites may have old and expired Leader Stores voucher codes and deals, but they do not. They say that the deals they have for you to click on are checked and updated on a daily basis. What We Found? We did find most of the main special offers and sale items that are happening right now on Leader Stores so at least their claim to stay up to date does seem true. But they also have an expired voucher codes section and suggest that you try them. This is something we never like to see as it can give potential customers false hope that they are going to save a little bit of money. When really they are just getting their time wasted. What they claim? Fyvor are a site who really do not make a whole lot of claims. They put their Leader Stores deals close to the top of the page so really if you want, you could just ignore all the other stuff they have going on and wow do they have a lot of links and other things going on here! What We Found? We had a really good look here and to be honest with you this is a site that is not overly offensive, trying to trick you into clicking all their links. But at the same time there is nothing here at all that makes it worth your time. They have just random links to different products on the Leader Stores site and not a single one of them is for a shed or other kind of garden building. Instead of coming here you would be better heading into the kitchen and grabbing a drink. MinistryOfDeals.com – Proud of having expired deals! What they claim? Ministry Of Deals do something that we have never seen another money saving site do. That is, right off the bat they tell you within the first sentence that they list current and expired Leader Stores voucher codes!